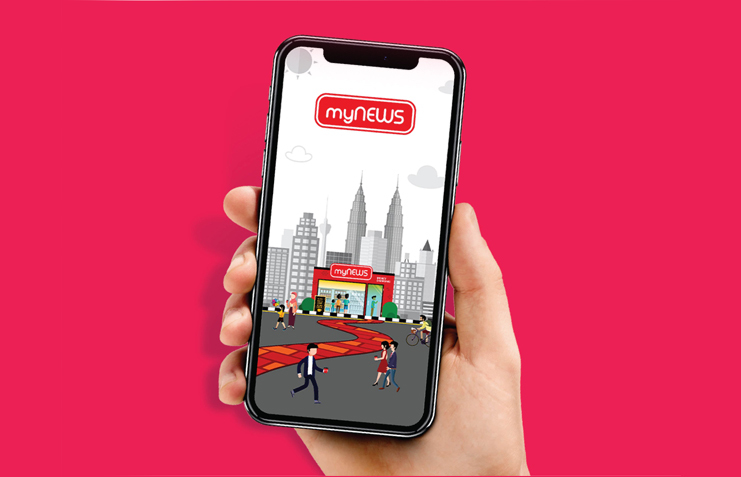 myNEWS Card is a store-valued card which provides you the convenience of making cashless transactions in any myNEWS stores* in Malaysia. Works perfect as a gift card too! Visit any myNEWS store and Grab one now! *Except for Senai International Airport. What is myNEWS Malaysia App? myNEWS Malaysia App provides you with a fast and easy cashless payment using only an App. Keep track of myPOINTS earned and receive exclusive members-only rewards by registering as a member in the App. Download and register now! Available on the App Store for iPhone and Google Play for Androids. Download myNEWS Malaysia App on the App Store for iPhone or Google Play for Android. Complete the registration process on myNEWS Malaysia App. You’re now a member! A virtual card is ready and available in your myNEWS Malaysia App. Start using now! Store value in myNEWS Card or myNEWS Malaysia App for cashless payment, greater speed, convenience and more rewards. Collect myPOINTS when uses your registered myNEWS Card or myNEWS Malaysia App to make cashless payment. You can use your myPOINTS to redeem coupons at any myNEWS.com outlets. Get members-only rewards and receive latest updates on members-only promotions, giveaways and contests. Receive extra bonus points and special rewards when you meet the qualifying criteria. 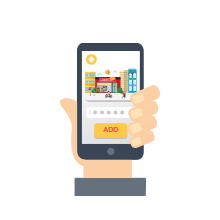 A myNEWS Card is a store-valued card that works exactly like cash which offers you convenience when you make any purchases at myNEWS.com outlets* in Malaysia. It allows you to top-up a monetary value onto your myNEWS Card for future purchases. *Not applicable to Senai International Airport Outlet. Where can I purchase myNEWS Card? myNEWS Card can be purchased in myNEWS.com outlets* in Malaysia. Upon payment, the Card must be activated at the cashier before making any purchases. How many myNEWS Card am I allowed to have? Is there a minimum or maximum amount the Card can hold? There is no limit on number of cards you hold. You can obtain as many as you wish. Can I still earn myPOINTS or make payment if I do not have myNEWS Card while shopping at myNEWS outlets? You can earn myPOINTS* if you registered your myNEWS Card on your myNEWS Malaysia App. Allow the cashier to scan your registered myNEWS Card / App to earn myPOINTS*. *Except for any purchasing of service (any reload services, starter packs, bill payment, courier services and money changing services). What are the benefits of using myNEWS Card? myNEWS Card allows you the flexibility of making purchases via cashless transactions and collection of points (members only). What should I do if my myNEWS Card is lost, stolen or faulty? Customer is solely responsible for the use of their Card. A replacement card will not be provided, and its card balance will be forfeited. If your Card is registered on myNEWS App. You will be able to protect your balance by blocking your Card and transfer the card balance to another registered myNEWS Card / Virtual Card via myNEWS App. Can I return a myNEWS Card that I purchased or received as gift and request for a refund? No. All myNEWS Card purchased or received are non-refundable nor exchangeable for cash. How to use the myNEWS Card? Do I swipe or insert the Card? Allow the cashier to scan all your purchases. Then, present your myNEWS Card for barcode scanning to proceed with the payment. Do my myNEWS Card expire? myNEWS Card will expire if not used in three years after the last transaction transacted. A RM10 administration fee will be charged for closing the account. Balance will be forfeited. What is myNEWS Virtual Card? A myNEWS Virtual Card is an online card that is not physically issued. It works exactly like myNEWS Card where customer can make any purchases at myNEWS.com outlets* in Malaysia. It allows you to register as a member without having to purchase a physical myNEWS Card. Where can I purchase myNEWS Virtual Card? You will receive a myNEWS Virtual Card for free when you download and register myNEWS Malaysia App to become a member. However, you are required to reload the Virtual Card to enjoy member-only benefits. How to use the myNEWS Virtual Card? You will need to reload your myNEWS Virtual Card to use it. For payment purpose, allow the cashier to scan all your purchases. Then, present your myNEWS Card for barcode scanning to proceed with the payment. Can I remove my myNEWS Virtual Card? myNEWS Virtual Card is unremovable from myNEWS Malaysia App. Can I block the Virtual Card? You are unable to block the Virtual Card however you can contact myNEWS Careline to force sign out from your myNEWS Malaysia App Account if you lost your mobile phone. Do my myNEWS Virtual Card expire? myNEWS Virtual Card will expire if not used in three years after the last transaction made. A RM10 administration fee will be charged for closing the account. Balance will be forfeited. Where can I get myNEWS Malaysia App? myNEWS Malaysia App is available on App Store for iOS or Google Play for Android. What are the benefits for registering myNEWS Malaysia App as a member? As a registered myNEWS Malaysia App member, you will receive membership communications about the membership program and rewards, your points collection, membership promotions and monthly specials. How do I add additional myNEWS Card into myNEWS Malaysia App? Go to ‘myCARDS’ and tap on the ‘+’ sign to add card. Enter your unique myNEWS Card Name, ID and PIN. Your myNEWS Card will now appear in your myNEWS Malaysia App. Do I still require to purchase a myNEWS Card to become a member? It is not mandatory to purchase a myNEWS Card to become a member. You will become a myNEWS member once you registered the myNEWS Malaysia App. A myNEWS Virtual Card will be provided after the registration. How do I add a myNEWS Card into myNEWS Malaysia App? How many myNEWS Card can I add into my App Account? You can add a maximum of 5 myNEWS Cards into your myNEWS Malaysia App Account. Inclusive of myNEWS Virtual Card will have a total of 6 Cards in your myNEWS Malaysia App Account. How do I change my Default or Primary Card on myNEWS Malaysia App? Select a card to be set as default or your primary card. How do I delete or remove a myNEWS Card on myNEWS Malaysia App? Tap ‘Confirm’ to remove the card. *By removing Card, you are unable to collect points with the Card via myNEWS Malaysia App and history will be deleted from this account. The remaining card balance will maintain stored on the Card itself. How do I make payment via myNEWS Malaysia App? Ensure coupon button(s) has been activated and present them to the cashier. Select a myNEWS Card on myNEWS Malaysia App and present your phone to cashier for verification of member status. Allow the cashier to scan all purchases. Present your selected myNEWS Card on myNEWS Malaysia App again to the cashier for barcode scanning to proceed with payment. *Please refer to the Redemption Instructions and Terms and Conditions prior redeeming your rewards. Report stolen or lost of mobile device via mynewscareline@mynews.com.my or contact Careline: 1 800 88 1231 (during weekdays Monday to Friday, working hours from 9am – 5:30pm). A few security questions will be asked for verification purposes. Once verified, myNEWS.com will force sign out from your stolen or lost mobile device. Alternatively, you will be automatically signed out from myNEWS Malaysia App account on your old mobile device when login to myNEWS Malaysia App with your new mobile device. Tap ‘Forgot Password’ link on the ‘Login’ Page. Enter your registered phone number and tap ‘Reset Password’. You will receive a 4-digit verification code via text message (SMS). Enter the verification code and tap ‘Next’. Enter your new password and confirm new password then tap ‘Done’. You can now log in with your phone number and new password. What should I do if I change my mobile device and want to use myNEWS Malaysia App on my new mobile device? You can download myNEWS Malaysia App from App Store for iOS or Google Play for Android on your new mobile device and sign in with your account information. Once you have signed in, you will be logout automatically from myNEWS Malaysia App Account on your old mobile device. Can I use myNEWS Malaysia App on multiple devices? You are unable to use myNEWS Malaysia App on multiple devices. You will be logout automatically from your previous mobile device when you signed into myNEWS Malaysia App with the new mobile device. How do I log in via Facebook and Google Account? You are required to connect your Facebook or Google under ‘myACCOUNT’ > ‘My Profile’ in order to login via Facebook or Google. How do I start earning myPOINTS? You are required to register myNEWS Malaysia App to become a member to earn myPOINTS. You will be awarded 1 myPOINTS for every RM1 spent at myNEWS.com outlets* in Malaysia. * Except for any purchasing of service (any reload services, starter packs, bill payment, courier services and money changing services). How do I check my myPOINTS balance? You can check your myPOINTS balance via myNEWS Malaysia App on ‘myCARD’ page. Is it possible to merge the points accumulated in separate myNEWS Cards? 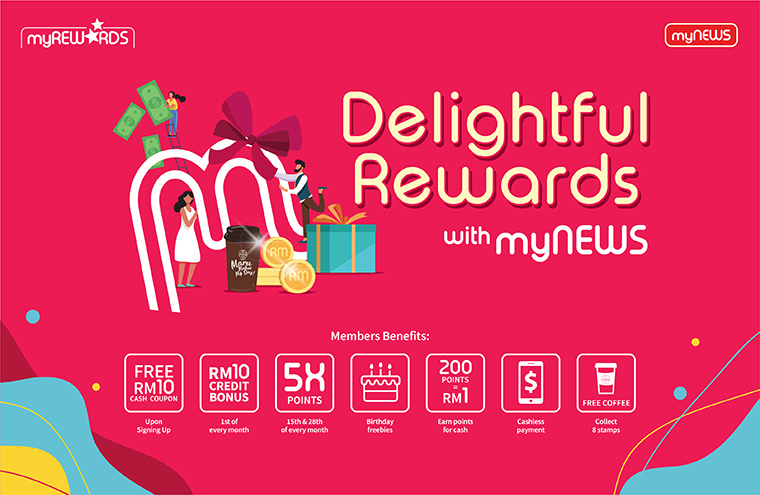 All accumulated myPOINTS from separate myNEWS Cards will automatically merge into one myNEWS Malaysia App Account if your myNEWS Cards are registered on myNEWS Malaysia App as a member (including myNEWS Virtual Card). Can I collect myPOINTS when I use multiple payment method in one transaction? You are entitled for myPOINTS* with amount paid for the said purchase with any payment method that’s available at myNEWS Outlets. Will my myPOINTS expire each year? Your myPOINTS will expire in one year rolling period from the date collected. For example, points collected in January 2017 will expire by 31 January 2018. How do I ensure my myPOINTS will not be forfeited? You will need to utilize the points before it expires. Can I collect myPOINTS when I redeem myPOINTS for purchases? You are not allowed to collect myPOINTS when you redeem your myPOINTS for purchases. There is 4 different types of reward under myREWARDS:- *Applicable when you registered myNEWS Malaysia App as a member. myDISCOUNTS Member discount on selected merchandise. Present your registered myNEWS Card or myNEWS Malaysia App to the cashier for verification of member status. Allow the cashier to scan your purchases. Present your registered myNEWS Card or myNEWS Malaysia App again to the cashier for barcode scanning to checkout. Price will be deducted automatically in condition of a successful barcode scan. Collect all stamps to exchange for coupon or gift. Once collected all stamps, tap ‘Redeem’ button to exchange for coupon to redeem the reward anytime. You will receive the coupon in myCOUPONS. *Please refer to myCOUPONS on how to redeem the reward. myEXCHANGE Use myPOINTS to exchange for coupon. 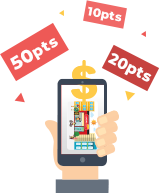 Tap ‘Exchange Now’ to exchange for your desired coupon anytime if you have sufficient points. Once you’ve confirmed to exchange, you will receive the coupon in myCOUPONS. Bonus points for selected merchandise. Bring all your purchases (including mySPECIAL merchandise) to the cashier counter. Present your registered myNEWS Card or myNEWS Malaysia App again to the cashier for barcode scanning to checkout. You will receive extra bonus points in condition of a successful barcode scan. Ensure the ‘Redeem Now’ button(s) has been activated prior to checkout and present them to the cashier. Note: Coupon will be deactivated after 30 minutes. Present your registered myNEWS Card or myNEWS Malaysia App again to the cashier for barcode scanning to checkout. Your activated coupon will take effect in condition of a successful barcode scan. Tap on the top right corner. Enter the Coupon Code and Verification Code to add the coupon. 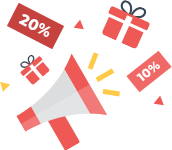 Your coupon will appear on myCOUPONS, Active page. How can I reload my myNEWS Card or myNEWS Malaysia App? Inform cashier the reload amount to your myNEWS Card. Present the barcode of your myNEWS Card for verification of member status. Present the barcode of your myNEWS Card again to reload. Inform cashier the reload amount to your selected myNEWS Card / Virtual Card. Go to ‘myCARDS’ and select a Card. Present the barcode of your selected myNEWS Card / Virtual Card to the cashier for verification of member status. Present the barcode of your selected myNEWS Card / Virtual Card again to reload. *Online reload is currently not available. How much value can I reload? You can choose a reload value from RM10, RM30, RM50, RM100 and RM150. Is there a maximum value/limit that can be stored in the card? Yes. For security reason, each myNEWS Card can store only up to RM1,500. Can I load or reload a myNEWS Card with another myNEWS Card? Unfortunately, the payment modes acceptable to load or reload a myNEWS Card are cash, debit card and credit card. You cannot load or reload a myNEWS Card with another myNEWS Card. How do I find out the card balance of my myNEWS Card? You can check your card balance at myNEWS.com outlet* in Malaysia by asking for balance inquiry from our friendly cashier. Select any Card that you wish to check. Card Balance will be shown under the barcode. Can I transfer a balance from my myNEWS Card to another myNEWS Card and how do I do that? Select a Card you wish to transfer balance from. Tap ‘Manage’ then tap ‘Funds Transfer’. Select and tap on the Card that you wish to transfer balance to. Tap ‘Confirm’ to transfer balance. *All balance within the Card will be transferred over to another Card. No partial balance transfer is allowed. Download myNEWS Malaysia App on App Store for iOS or Google Play for Android. 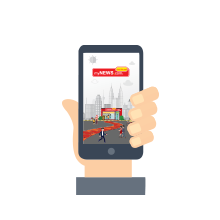 Create your myNEWS Malaysia App Account by registering in the App and you will become a member. What is the validity of myNEWS membership? To avoid card deactivation, the validity of myNEWS membership is 3 years from the last transaction transacted. What are the requirements to get upgraded to next Membership Level Status and what is the benefit? There are three levels of myNEWS membership. Advance through two elite levels when you meet qualifying criteria in one year rolling period. Silver n/a 1 myPOINTS for every RM1 spent. Gold Spend a minimum of RM1,000 in one year rolling period. 1.1 myPOINTS for every RM1 spent. Platinum Spend a minimum of RM2,000 in one year rolling period. 1.2 myPOINTS for every RM1 spent. Can I track my progress in my Membership Level status to reach the next level? Yes, you can check your progress in ‘myACCOUNT’ under ‘My Ranking’. How does the one year rolling period works? A one-year rolling period means one-year (12 consecutive months) where a new one-year period begins on the date of myNEWS Malaysia App Member Registration or an upgrade in Membership Ranking Level. Customer Y & Z registered to became myNEWS member. Customer Y & Z is a SILVER member by default. 1st Jun 2017 Customer Y & Z spent more than RM1,000 and became GOLD member. The one year rolling period resets. 1st Aug 2017 Customer Y & Z spent more than RM2,000 (since 1st Jun 2017) and became PLATINUM. The one year rolling period resets again. 1st Aug 2018 Customer Y spent less than RM2,000 from 1 August 2017 to 31 July 2018 (1 year rolling period). Customer Y will be downgraded to GOLD member. Customer Z spent more than RM2,000 from 1 August 2017 to 31 July 2018 (1 year rolling period). Customer Z will maintain as PLATINUM member. Will I get downgraded if I did not meet the requirements each year? Yes, you will be downgraded by 1 level if you did not fulfil the minimum spending in one year rolling period. For example, if you are a Platinum member and you did not fulfil the minimum of RM2,000 purchases in one year rolling period. You will be downgraded and become a Gold member. What will happen to my Accumulated Purchases for Membership Level at the end of the rolling year? Your Accumulated Purchases will expire and reset to zero on each year rolling period. Can I pay using multiple myNEWS Cards, myNEWS Malaysia App or other payment methods for one transaction? Yes, you can make multiple payment methods in one transaction. Select a Card and tap ‘Manage’. Tap ‘Transaction History’ to check your transaction history of the Card. Tap ‘My Visit History’ to check your transaction history by visit. *Amount purchased and myPOINTS for any purchasing of service (any reload services, starter pack, bill payments, courier services and money exchange services) will not be displayed on myNEWS Malaysia App. How can I remove myself from your push notification list? Uncheck “I would like to receive information from myNEWS.com”. * By unchecking the notification, you will no longer receive any marketing and advertising information and materials from myNEWS.com. I’m unable to edit my personal information such as Gender and Date of Birth. You are not allowed to edit your ‘Gender’ or ‘Date of Birth’ after your first registration. How can I comment or give feedback about an experience I had in a myNEWS.com outlet? Select a visited outlet and tap ‘Feedback’. Leave a comment or provide us your feedback at ‘Visit Feedback’. Tap ‘Submit’ when you’re done. *Alternatively, email us your feedback via mynewscareline@mynews.com.my. How can I update my email address on myNEWS Malaysia App? Enter your new email address in ‘E-Mail Address’. Tap ‘Save’ to update your email address. How can I change my password on myNEWS Malaysia App? Go to ‘myACCOUNT’ and tap ‘My Profile’. Enter your registered mobile number and tap ‘Get Verification Code’ to request a verification code. Enter the 4-digit verification code found in the text messaging (SMS) sent to you. Enter your new password and confirm new password. Tap ‘Confirm’ to change the password. What should I do if I have changed my phone number? Request for verification code by tapping ‘Get Verification Code’. Tap ‘Confirm’ to change your mobile number. What should I do if I would like to update my personal details? Update any related personal details. Tap ‘Save’ when you’re done. Why should I connect my myNEWS Malaysia App account with my Facebook or Google account? By connecting your Facebook or Google account, you can log into myNEWS Malaysia App faster and conveniently without entering your registered phone number and password.